The Choose User function allows you to quickly navigate through hundreds of users and narrow your search by an individual’s User Role. For example, you can quickly locate a guard without having to search your entire data base of Sup/Admins, Dispatchers, Customers and Inactive users by simply selecting the Guard box option. There are a couple scenarios however, that when searching for a specific user in a specific user role whereby the search comes up blank. Depending on the Operating system you are using and the updated version you are on, you may have an auto populate setting turned on. If this is the case you will likely see a User Name auto populated in the Search First / Last / Username field as seen above. If you remove the auto populated User Name the entire list of Users for the selected User Role will then display. This is not a Silvertrac Software function but rather a Setting on your PC. If you want to you can turn the Auto Populate function off in your computer Settings. Another scenario where a search may come back blank is if the user has been made inactive. 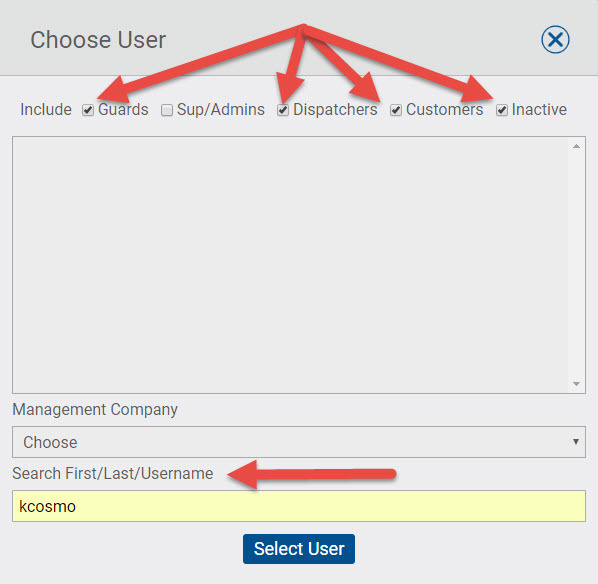 Selecting the inactive box in conjunction with a User Role will display both active Users in that Role and also any Inactive Users in that role at the end of the list with an (Inactive) prefix.